Recently, the chances of seeing Pepper in the middle of the street have really gone up. At our company, where we not only do event rentals, planning, and operation, but also corporate business model Pepper application development and installation support, we have also seen an increase in questions from companies who are considering an installation, like “What exactly can Pepper do?” and “Which plan should I use?”. We think you’ve probably taken a look at SoftBank’s homepage, but rather than the features and plans, you probably want to know exactly how your company might use it, about how much will the costs run, and other slightly more detailed information. For those of you with this kind of concern, from the perspective of our company which has supported many corporate installations, we’re going to explain Pepper in a way that’s easy to understand with specific examples. *This article’s subject matter is based on information as of March 19, 2016.
Pepper is available in two varieties: Basic retail model Pepper and Pepper for Biz (corporate model). In this article, we’re going to explain the details of the Pepper for Biz (corporate model) which is popularly used in businesses. ・Reception at restaurants, banks, hospitals, etc. ・Customer service such as explaining products at retail stores, showing customers around a complicated floor plan, etc. ・Customer outreach at event halls, trade show exhibitions, etc. Even in other ways, Pepper’s work can be freely customized, so depending on the user’s situation, many tasks can be left to Pepper. 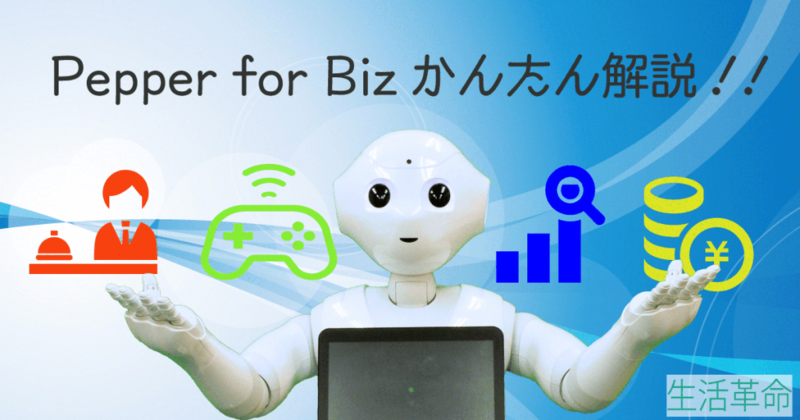 Pepper for Biz is, for ease of use in this type of scenario and user-friendliness for businesses, a model equipped with the below features and support. Templates are available to easily create customer service and reception work. Before installation, you can try a free template offered so that you can better picture how to use Pepper. Customer service and outreach, which up until now have proven difficult for humans, can be analyzed with ease. Various sensors on the main Pepper unit automatically collect various data, so information such as the number of people received, along with basic demographic details such as customers’ age and gender can be collected effortlessly. Also, you can also grasp the impressions of customers who used Pepper, so you can confirm the effectiveness of sales pitches and customer outreach methods. All of this information can be easily confirmed via computer management screen, allowing you to perform efficient analysis and improve operations effectively. Even if you have a sudden breakdown or are unsure of how to use your Pepper, you can be at ease, as a specialized support window is offered. Also, because there are many different uses for Pepper, there are a lot of worries that it could break, such as, “Won’t it break if customers touch it?” “Is it OK to use it outside of the store?”. For those types of concerns, even failures due to willful or negligent causes are supported with the option service “Pepper for Biz Security Insurance Pack” offered (with fee). With Pepper for Biz agreements, two plans are offered: rental and purchase. Rental plan: The unit and basic service become a set offered by SoftBank. The rental period is fixed at 36 months, so the length of rental cannot be chosen. When cancelling mid-agreement, the balance for the remaining time must be paid. Purchase plan: In addition to the rental plan, there is also a purchase plan. When purchasing, you can choose between purchasing just the unit, or the unit and basic plan set. For using Pepper as a rental, agreements for the “Pepper unit” and “Pepper for Biz Basic Plan” are required, along with an optional “Option Service”. In the “Pepper Unit”、in addition to the Pepper robot body, the charger and accessories for using Pepper are included. The Pepper unit rental costs a monthly fee of 27,500 yen. With the “Pepper for Biz Basic Plan”, basic service and support for using Pepper is included. Unit rental requires a separate monthly fee of 27,500 yen. In the case of unit rental agreement, the Pepper for Biz Basic Plan is required. As an option service, “Pepper for Biz Security Insurance Pack” (Optional) is offered. With the Security Insurance Pack, breakdowns that the renter is responsible for which are not covered by the basic plan’s warranty are also insured. For those enrolled in the Security Insurance Pack, fees incurred at the time of breakdown are limited to a diagnostic fee of 30,000 yen. “Pepper for Biz Security Insurance Pack” costs a monthly fee of 9,800 yen. When purchasing Pepper, the unit alone costs 1,260,000 yen; the unit and basic plan as a set costs 2,250,000 yen. The basic plan and option service contents are the same as for rentals. What is the total cost of the unit and service? Here, we have collected the fees required for a Pepper agreement. You can see that at a rental period of 36 months, the rental is a comparatively better deal. *A robot handling fee of 9,800 yen is separately required. Pepper for Biz runs a minimum of 2,000,000 yen. Also, as rentals are for a minimum of 36 months’ agreement, the hurdles are a bit high if only using it for the duration of the agreement period. At Seikatsu Kakumei, we offer rental service starting from one day in length. As we have extensive event experience, if you’re looking to outsource Pepper event consultation or Pepper event operation, please be sure to consult with us. ← [Press Release] Big Screen Display Interlocking System for Pepper Rentals Appears!